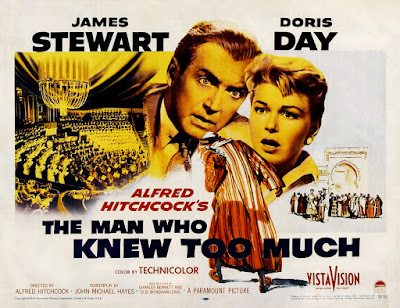 The 1956 version of The Man Who Knew Too Much is one of the 1001 classic movies you should see. Each Monday, I'm going to recommend a classic movie you should see (for the reasons behind the 1001 series and reviews of earlier films covered go here). Today, I'm wrapping up February's theme of Love and Marriage Hitchcock Style, with a look at director Alfred Hitchcock's remake of his 1934 classic, The Man Who Knew Too Much. The Man Who Knew Too Much tells the story of Ben and Jo McKenna (James Stewart and Doris Day), an American couple who are vacationing in Morocco with their young son, Hank (Christopher Olsen). The McKenna's make the acquaintance of a mysterious stranger (Daniel Gelin) while on a bus to Marrakesh, and when the stranger reveals the plot for a high-profile assassination just before he is murdered, the McKenna's become embroiled in a dangerous international conspiracy. 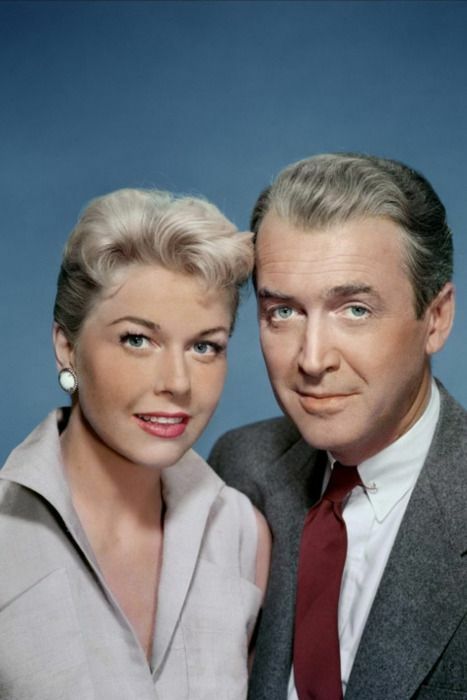 Doris Day and James Stewart as the McKenna's in The Man Who Knew Too Much (1956). Hitchcock had long planned to direct a remake of The Man Who Knew Too Much -- this was one of the reasons producer David O. Selznick put Hitchcock under contract in 1940 -- but, for one reason or another, the director never got around to it until 1956. By that time, he needed a quick project to fulfill his contract with Paramount Pictures, so he dusted off The Man Who Knew Too Much. The director changed a few things -- the married couple were switched from British to American, the kidnapping takes place in Switzerland rather than North Africa -- but mostly Hitchcock left the suspenseful plot intact. Most of the other marriages in Hitchcock films I covered were dysfunctional to some degree, but that's not the case in The Man Who Knew Too Much. The McKenna's are a stable married couple who sometimes get on each other's nerves and sometimes quarrel -- At one point Day's character says to her husband, "Are we going to have our monthly fight?" -- but in the end they love and trust one another. The pressures on their marriage come from the outside, and, rather than fall apart or blame each other, they work together and support each other until their family is reunited. 1. The original vs. the remake. There is a lively debate among Hitchcock fans about which version of The Man Who Knew Too Much is superior. For his part, Hitchcock told Francois Truffaut that "the first version is the work of a talented amateur and the second was made by a professional." I don't think there's anything in either film that can compare to Peter Lorre's magnificent performance in the original, but overall the remake is the superior film. Stewart and Day give better performances as the leads, and the location shooting is exceptional. 2. Que Sera, Sera. Even those who haven't seen The Man Who Knew Too Much are familiar with its theme song "Whatever Will Be, Will Be (Que Sera, Sera)." The bouncy tune was written by Jay Livingston and Ray Evans as a song that Day's character could sing with her son. Day reportedly disliked it, but it became one of her biggest hits, and Livingston and Evans won the Academy Award for best original song. 3. The Albert Hall sequence. The high point of The Man Who Knew Too Much is the assassination sequence at Royal Albert Hall. It is one of the great scenes of Hitchcock's career, played in pantomime while the London Symphony Orchestra conducted by Bernard Herrmann performs Arthur Benjamin's Storm Clouds cantata. 4. The final sequence. The climax of the movie is based on a story about medieval English king Richard the Lionheart. According to legend, Richard was a captive during the Crusades when his loyal troubadour searched for the monarch by singing his favorite song outside enemy castles. One day, the troubadour discovered Richard's whereabouts when the king joined in on the second verse. 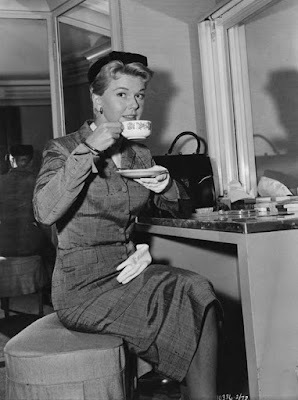 Doris Day takes a tea break on the set of The Man Who Knew Too Much (1956). Courtesy of Getty Images Archive. Other critics:The Man Who Knew Too Much has a 91 percent fresh rating at Rotten Tomatoes. Leonard Maltin prefers the original, and in his Classic Movie Guide calls the remake "disappointing" in a 2 1/2 star review. The movie was a huge hit in 1956, and the critics were equally impressed. Bosley Crowther of The New York Times wrote, "even in mammoth VistaVision, the old Hitchcock thriller-stuff has punch" while the critic at Variety noted, "while drawing the footage out a bit long, he still keeps suspense working at all times and gets strong performances from the two stars and other cast members." The bottom line: The original The Man Who Knew Too Much is a wonderful film, but the remake is well worth watching for the Royal Albert Hall sequence alone. Availability: The Man Who Knew too Much is available on DVD and Blu-ray. Next Monday, I'll begin the March theme of Biblical epics with a look at Ben-Hur (1959).